Fire Truck Roll Neck: finished! 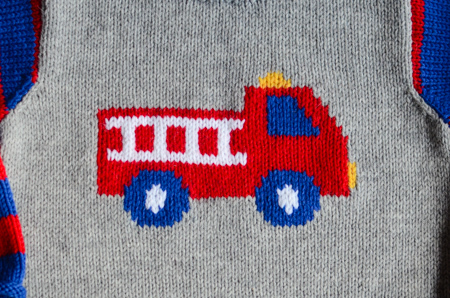 Pattern: Fire Truck Roll Neck by Gail Pfeifle of Roo Designs, 6 year old size. As I previously mentioned, I followed the shaping of the 5/6 size of the Jay sweater from The Rowan Story Book of Little Knits, including the addition of shoulder and armhole shaping. It was quite serendipitous that I came across this pattern: as you can see below, even though the armhole is shaped, it’s very basic and blocky, nearly a drop-shoulder sleeve. So, it’s in keeping with the original look and style of the Fire Truck Roll Neck, but it will fit better ;). Yarn: Cascade 220 in the following colors: 8401 (silver gray, about 1.5 skeins, though the pattern calls for 3 (!) skeins if knitting this size), 7818 (blue velvet), 8895 (Christmas red), 8505 (white), and 7827 (goldenrod). Needles and finished measurements: I used the recommended US 5 and US 7 needles. The sweater was knit to the recipient’s specs, 30″ chest circumference, 16″ from shoulder to hem (can be unrolled to be longer), and 12″ sleeve length to underarm (again, can be unrolled… or rolled up). Weave in all ends except those which might be used for seaming. Seam the sweater together and knit the collar. Steam block all the seams and the collar. In addition to all the intarsia ends, the sleeves had lots of ends because I cut the yarn for each stripe – the stripes are 8 rows high, which seemed too high and messy to carry up. So, I needed the sweater to block well, to secure and conceal all those ends. I think the steam blocking was a good choice – compare the pictures above with pics of the unblocked! 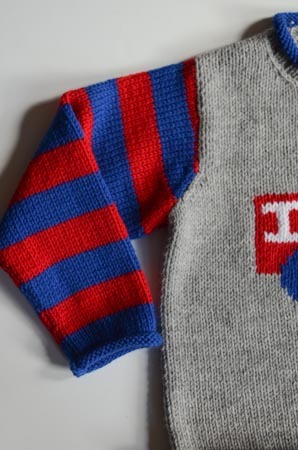 Oh I love it, what a fantastic sweater for a little boy! It looks fantastic!! SO cute. Looks good – did you use the “washable” Cascade? Those Roo patterns are very appealing. It’s interesting how much smaller the central design looks on a bigger size. 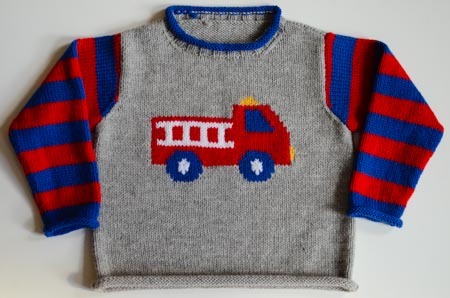 I hope the firetruck sweater is beloved by the recipient! The sweater is gorgeous. I love the colorwork. That is frikkin ADORABLE!!! I need to make a stocking for my new baby to match the rest of the family’s but I keep avoiding it because of the intarsia. Why was I such an over-achiever before kids?